You can now enjoy Christmas just at some simple clicks. This festive-themed online slot offers some great payouts and high visuals in order to make it the best festive season in all terms. 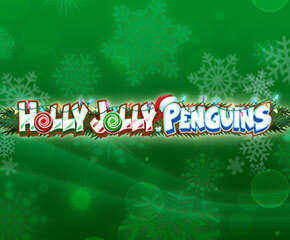 Holly Jolly Penguins is brought into the market by Microgaming. Holly Jolly Penguins has to be played with five reels which are designed on three rows and forty-five paylines. The designs have been beautifully laid with Christmas lights winding the colourful frame of the reels. The complete display is shown with various Christmas decorations and the best part to notice here is that the Penguins have also decorated the space surrounding their local lake. The major symbols in Holly Jolly Penguins are also designed as per the theme. It consists of Four penguins who are designed in various types of festive poses giving it a joyous appearance and the must include the symbol, a Christmas tree. Apart from this, the lower valued symbols somewhat lack the creativity in them and are simply represented by the card values 10, J, Q, K, and A. Apart from these, the special symbols are designed as penguins as well. Two penguins, one of them having a stick of rock and the other one as a cute carol singer represents the wild symbols. They replace the rest of the symbols in order to form some extra winning combinations. The sledging penguins symbol is the scatter and it can’t be replaced. Free Spins – Just like any other standard slot, Holly Jolly Penguins also asks you to land three or more scatter symbols from the left side to activate the free spins. If you will land three, four or five symbols than it will award you five, ten or twenty spins respectively. You must keep in mind that positions of these triggering symbols are necessary out here because landing two scatter symbols on the second and the third reels will double spins awarded. Similarly, landing two scatter symbols on the second and the third reel will quadruple the spins awarded. If you will be able to land three or more sledging penguins at correct positions during free spins round then it will award you some extra spins which can go up to eighty. 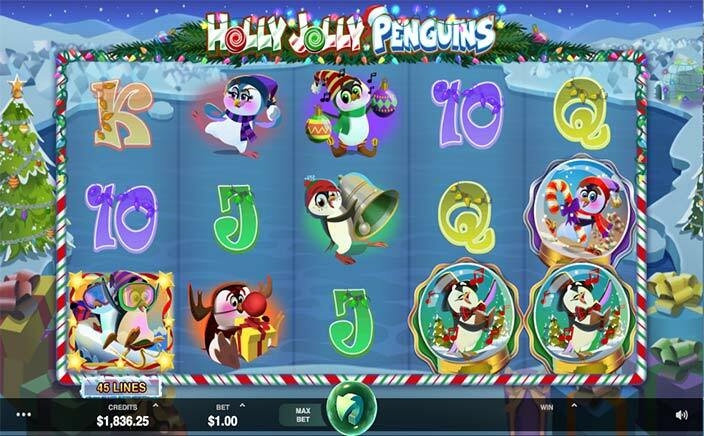 Holly Jolly Penguins is a perfect slots game to visit during the Christmas month when you find it difficult to wait for the actual Christmas. You might also get some good Christmas gifts by the abundant bonus feature and the multipliers available her. The slots game comes with an RTP of 97.00%.